To promote retention of ASA members as they transition from full-time work to retirement. To promote interaction and a sense of community among retired members. To promote interaction between retired members and other members at all career stages. To lessen the sense of isolation felt by some retired members. To provide the means for sharing information about opportunities in teaching, research, and other activities that would benefit from the expertise of retired sociologists. To provide the means for sharing information about other issues of concern to retirees, such as financial security, health care, and relocation possibilities. To serve as a resource for the regional ORNs that already exist or are being established at the Eastern, Midwest, Pacific, Southern, and other sociological societies. At the 2014 Annual Meeting, ASAORN will hold an evening meeting to discuss procedures for the new group and to elect a governing committee. Beginning with the 2015 Annual Meeting and moving forward, ASAORN will organize a paper session relating to retirement issues, provide a professional development workshop on a topic, such as “transitioning to retirement,” and hold an evening event that might combine a meeting for retired members and others interested in issues of retirement with an invited lecture by a late-career sociologist. A ticket-based reception or dinner may follow the evening event. ASAORN will also be exploring ways to help retirees network with colleagues around research interests and lifestyle questions beyond the Annual Meetings, through newsletters, regular articles in Footnotes, and use of various forms of social media. 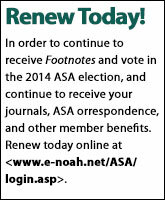 According to the proposal, “in addition to providing support, interaction among retirees would enable the dissemination of opportunities for new professional endeavors, such as visiting or part-time teaching appointments, volunteer consulting, activism, or collaborative research.” To facilitate this type of interaction, the ASAORN Listserv (established for others interested in this initiative after the 2013 Annual Meeting) will be expanded to automatically include all emeritus/retired members of the ASA (with an opt-out provision), as well as other members who wish to be included.